These days, it’s all about your customer’s convenience. They want to be able to reach you, find your menu, see your location, take a picture of what they’re eating and drinking, and then post a review for everyone to see. That can all be done through social media, because last year Facebook and OpenTable, a restaurant reservation website, paired up to introduce a reservations system on a restaurant’s Facebook page using their mobile device’s Facebook App. It’s perfect, because according to Facebook, more than 654 million users access Facebook every day from a mobile device. Facebook also says that it has 1.07 billion monthly active users who look at Facebook using their mobile device. Even if the Facebook user doesn’t have the OoenTable app on their phone, they can still see it under the tab and use it to reserve a table at your restaurant. 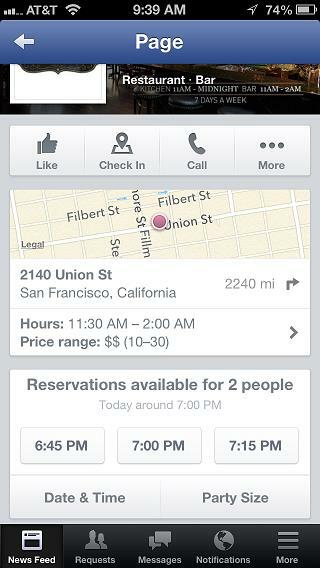 Here’s a step-by-step guide to setting up your OpenTable Reservation tab on your Facebook page. First, you must be using OpenTable. If you aren’t, go here to set it up. Once you are set up, you’ll receive an OpenTable account number. Notice that the phone screen will show reservation times you already have listed in your OpenTable account, and that your customers can choose the date, time, and party size, just like on the OpenTable website. When they press a button with the proper time on it, their contact information that is already stored in Facebook will appear, which will allow you to contact them to confirm the reservation. Now that you have the OpenTable tab set up, you should start promoting it. Add some text to your website and write a blog about how this new tab works. On your Facebook page, tell your fans how easy it is to make reservations now—right from their mobile device! You may want to pay to have that post boosted so that it reaches all of your fans, and you can also direct Facebook to find potential customers within a 10-mile or more radius and within a certain age range. In your restaurant, set out cards or other marketing materials that will let your customers know that they now have a convenient option for online reservations. This is one of the easiest changes that you can make—it shouldn’t take more than 45 minutes. If you don’t already use OpenTable, you may want to consider it. Integrating a reservation system with the Facebook app will help drive customers to your restaurant!